Last week I sewed the Morris Blazer by Grainline Sudio. The fabric is my very own Mesa Plaid, part of the new sustainable cotton collection. If you live in the NYC area, you may have already seen me wearing it ;) . For everyone else, this pic is really just a sneak peek. I plan on doing an entire blog post on cutting and sewing the blazer in Mesa Plaid in the near future. As with each project, I learned a bunch, and I have a few notes on using this fabric that I need to jot down and blog about, while they're still fresh. Mesa Plaid, I've decided, is really a borderline sweater knit (That's a category, right?) coming in at about 12 stitches per inch. It's quite stable and heavier than the type of knit used for a dress. In fact, it's the densest knit of the sustainable cotton knit collection. 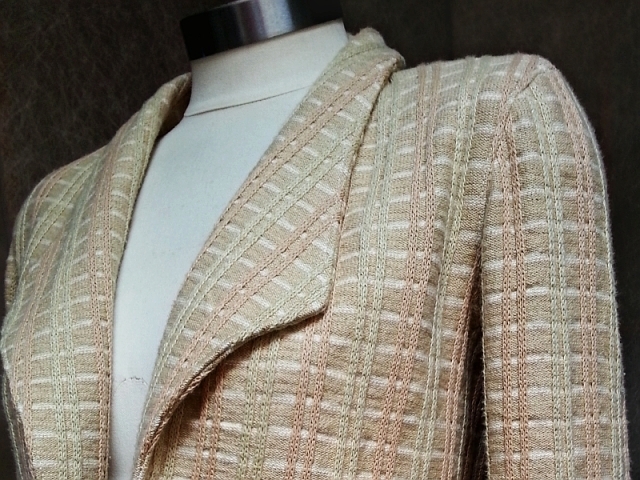 I've loved the Morris Blazers that I've seen popping up on social media and thought it was a good match for Mesa, since "medium weight stable knits" were listed in the Suggested Fabrics section. The blazer has turned out to be the perfect spring into summer jacket and so very comfortable, because it's a knit. 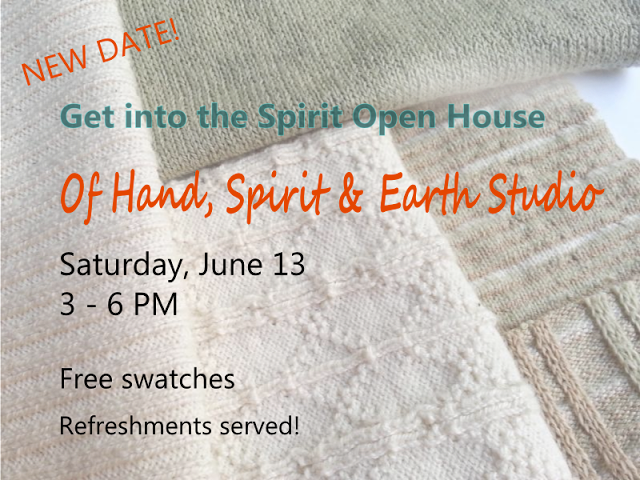 And speaking of spring into summer, it's the name of this month's Open Studio Event. (Ed. The Spring Into Summer event was postponed. OUR NEW DATE IS JUNE 13, 3-6 PM.) I'm crossing the Hudson River for another open house at Of Hand, Spirit & Earth Studio in downtown Jersey City NJ! All in the area are invited to come feel the O! Jolly! fabric and try on the beautiful gemstone jewelry by Jacquie Bird of SilkWire Jewelry. Free swatches and refreshments will be served! Free shipping, too, if you wish to order. Of Hand, Spirit & Earth Studio is located on a pretty, tree-lined street in downtown Jersey City at 15 Mercer Street, Suite 1 [Google map]. If you're coming from Manhattan, just take the PATH train to the Grove Street stop. (It's a 7-minute ride from the World Trade Center or 18 minutes from 34th Street.) It's that easy! Kindly RSVP ON Eventbrite. Looks amazing! Look forward to seeing the modelled jacket! Thank you, Sarah! I hope that can happen this week. Mostly I want to sit and write my notes before I forget! !